In this tutorial, we use the GLLB-sc to calculate the band gap of KTaO3 using the XC functional GLLB-sc. 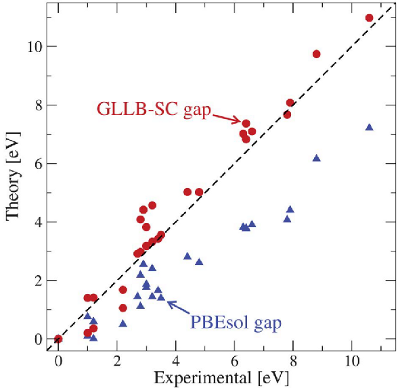 This functional uses the GLLB response potential to replace the PBEsol response potential of the exchange. [GLLB-sc] This has been shown to improve the band gap description as shown in the figure below taken from [Castelli2012]. Spin-polarized GLLB-SC is currently implemented to svn trunk. However there are some convergence issues releated to fermi smearing and the reference energy of highest orbital. Also some parts are still untested. The code will be improved to robust version soon, but in the meanwhile please contact mikael.kuisma@tut.fi before using.